Another Thursday, another storm. Our weatherman appears not to like Thursdays. 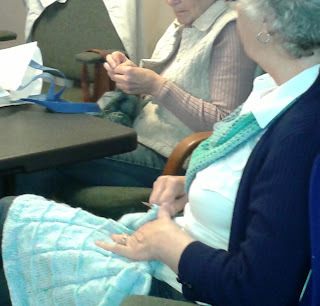 Thankfully, today's storm gave us rain, not ice, and the drive to knit group happened without incident. Nice to be there, because our snowbirds, have returned. Carol and Sandy, are not like me. They are real snowbirds, - the kind that stay in Florida for 6 months. 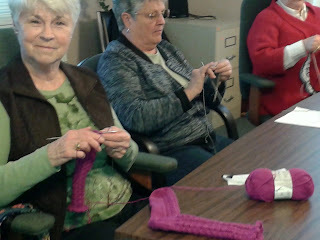 Today was their first day back at knit group this spring. 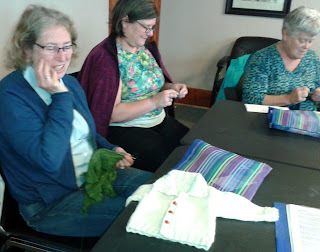 It was great to see them and their knitting. Sandy has two cute, cute, cute little sleeper outfits for her latest, soon-to-arrive grandchild. 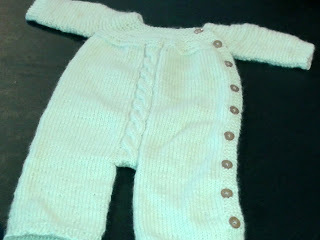 A close-up shot to show all the buttons - and buttonholes - Sandy put on this sleeper. Carol worked on a pair of red socks. She said she spent much of the winter knitting socks for everyone in her family. She has a teenage Grandson who won't wear anything but Grandma's hand knit socks. Imagine! A teenager, no less! Speaking of socks, Jean has another pair on the go. Another pair of two socks on two circs - Jean's favoured method. Sharon too is knitting for baby. Although Sharon has been blessed with three, ready-made, step- grand kids, her daughter announced at Easter that she is expecting her first baby. Sharon's known for a week and look what has been produced already. Sharon R is also in a baby knitting mode. Here she knits on the blanket that has been her in-between project all winter. She also knit the cute little baby sweater below, but ran out of yarn just before finishing the cuffs. The only ball she could find was of a different dye lot and sadly too far off to make the knitter happy. She has decided to rip those cuffs back and knit them in red to match the buttons. A great solution, I think. 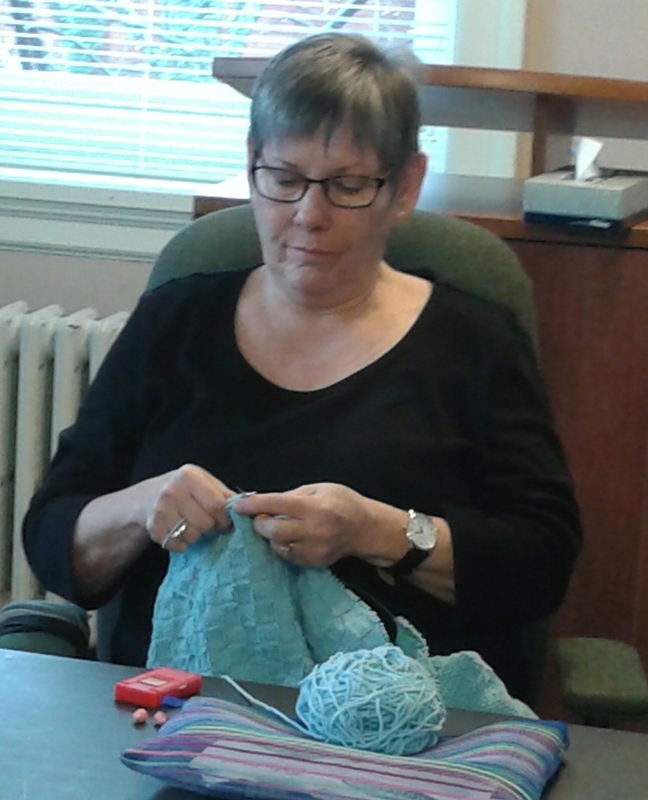 A great afternoon of knitting and as we left, Sharon R spoke about the dreary, rainy weather. 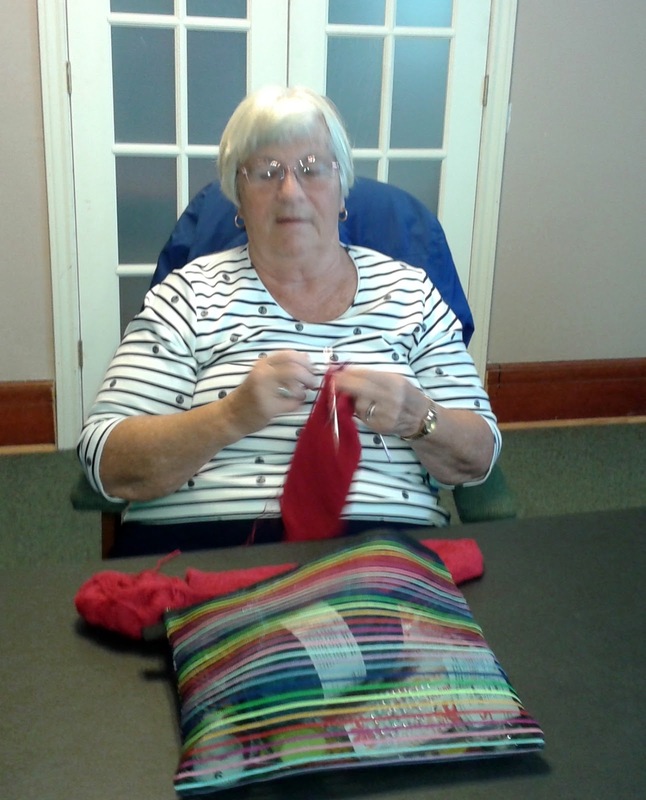 Her comment was "What a great afternoon to go home and knit." Exactly! With spring on the horizon - far-off horizon it seems, as the weather man is predicting another snow storm to come in the next few days - I decided to make a 'fix' to a favourite summer top. 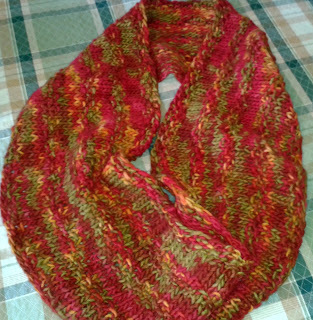 My Cotton Concerto, I knit last year. Although it was pretty perfect, I did think another inch of length would make it perfectly perfect. Since I had a ball of the yarn left over, I thought - "Why not?" Lengthening a piece knit top down is easy. Simply unravel the ribbing and knit more body before re-knitting the ribbing. Lengthening a piece knit bottom up isn't difficult either, but does require courage. You cut off the ribbing, pick up the now-empty stitches of the body and knit down the required extra length before re-knitting the ribbing. So while most of the piece is knit bottom up, the lower bit is knit top down. And no, you cannot see the difference. Following those guidelines, I removed the ribbing by cutting one stitch and then tediously teasing the yarn from the stitches, one stitch at a time. When the tail of yarn got too long to tease out of the stitches easily, I'd clip it and resume the tedium. This took me one entire evening. 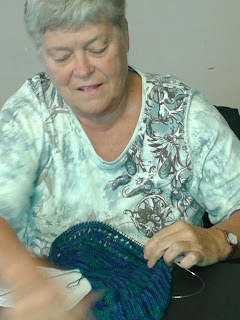 Then the body stitches were picked up and I began knitting. I added about an inch and now am into row 3 of an 8 row ribbing. 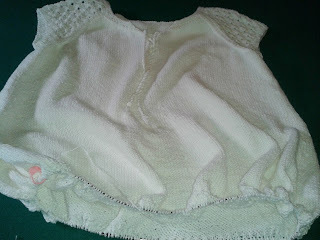 If the snow storm prediciton comes true, my summer top will be lengthened and ready to wear before we even have spring. PS. Blogger's spell check isn't working today. I did my own. Sorry for any I've missed. We woke up to the 'storm of the century' Thursday morning. A March ice storm. Never nice. I did think to try to get to knit group, but after I heard from both Sharon's that they weren't going to venture out of their homes - and they live mere blocks from the library - I decided to stay home for a Netflix Knitathon. Quite enjoyable actually. Between that afternoon of knitting and a 6 hour round trip to Sis' house for the family Easter Dinner, this is what my needles accomplished. A small little cowl, called the Ying Yang Cowl by Laura Olsavsky. 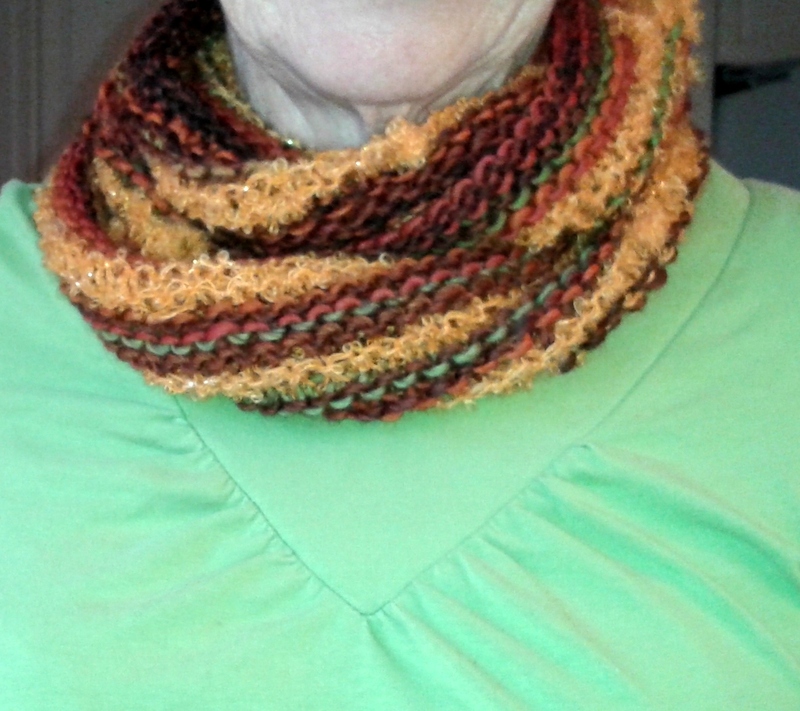 A cute and quickly knit little cowl that folds over nicely in front for a bit of extra warmth. Mine was knit with yarn, long ago re-claimed, from a failure of a knit. A shawl that made me look more Granny-like than I was - or am - prepared for. Koigu yarn I think. But I could be wrong about that. Colours are much more true in the lower picture. 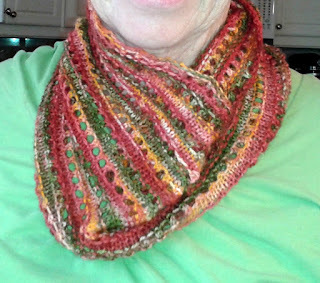 After the shorty cowl, I grabbed two balls of complementary stash yarn and cast on 100 stitches with 8mm needles. Working garter stitch while alternating colours every few rounds made for great car knitting. Again, the colour is more true in the lower photo. The variegated yarn is a very soft, loosely spun, roving type of yarn whereas the orange is a curly mohair that tangled frustratingly often. Both those yarns I am sure were snatched at one of Sandy's Sister Sue's Great Give-Aways. Both lovely cowls that are inching me forward towards my 2016 goal of stash annihilation. 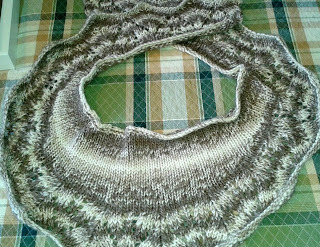 My knitting goal for 2016, at first glance, seems to be to use up stash. If I ask myself what is the best way to use up stash, I have to answer that, for me, it is by knitting small projects. 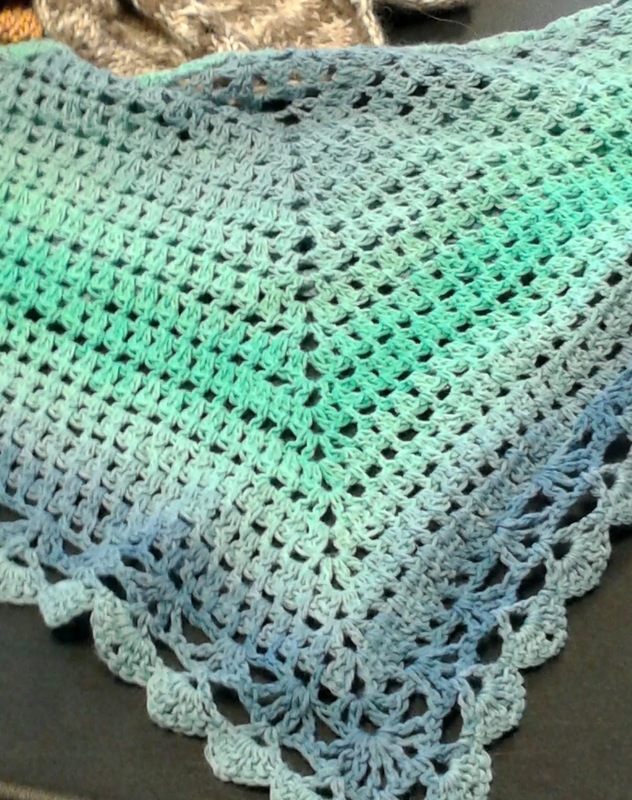 Projects that take one skein of yarn. 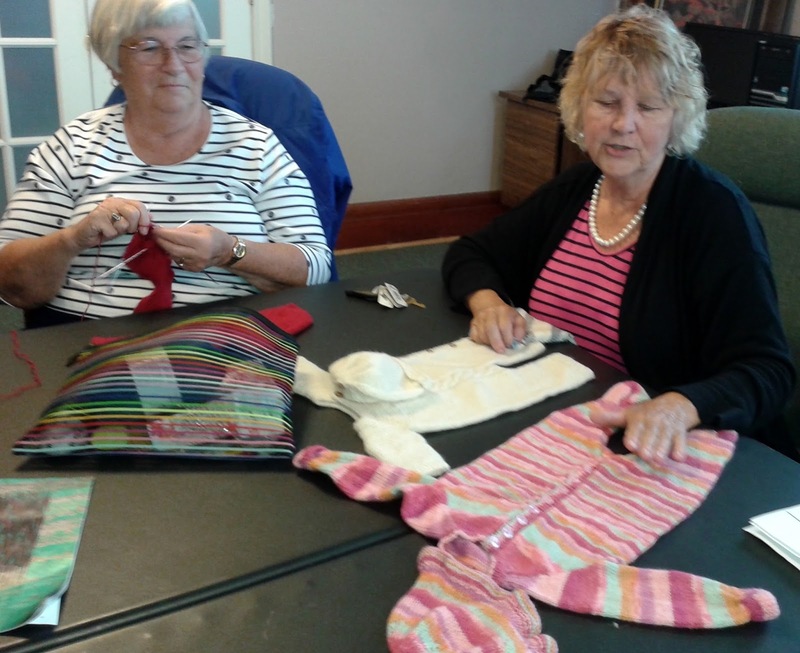 Projects that cover the head, neck and/or shoulders. 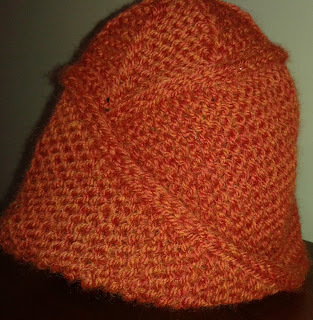 As far as my knitting is concerned, 2016 could be called my 'head and shoulders' year. I have two hats today to show off. This one is the Frederica Beret. 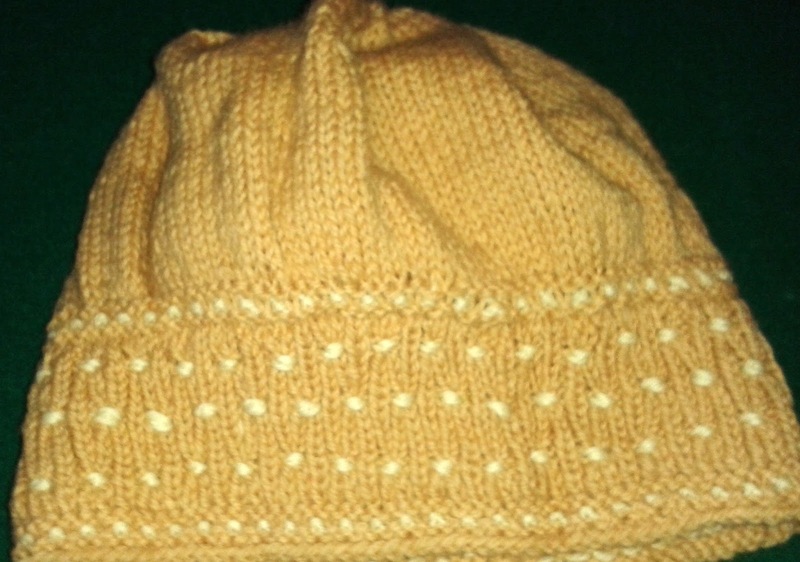 A simple tam with a deep, smocked band. I have never smocked in my life before, so that took a few starts to accomplish.And I can't say that mine looks nearly as good as the pattern model, but not bad for a first attempt. My Frederica was knit with Patons Classic. The only mod was to rip back from the 4 inches of plain knitting above the brim to 3 inches. Once the beret was finished I tried it on and felt it was way too much hat. Rip, rip and I shortened it by one inch and like it much better. a Jared Flood pattern that has been in my queue for years. 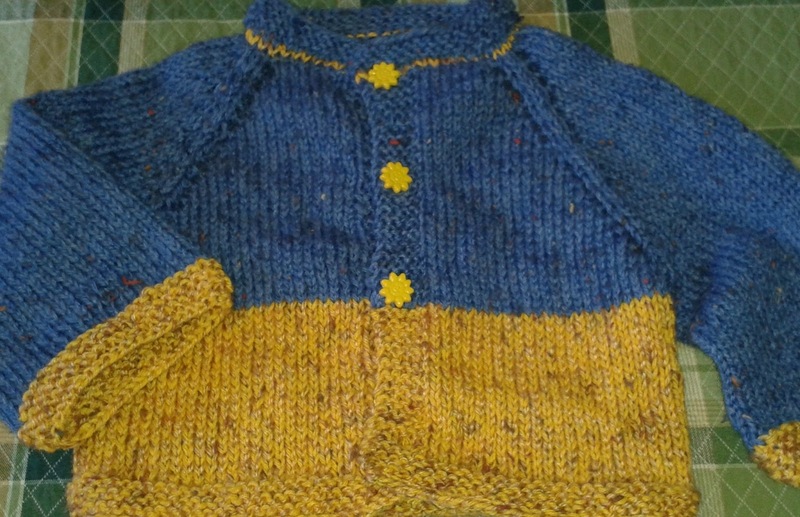 I am glad to have finally knit it. And what an easy knit. 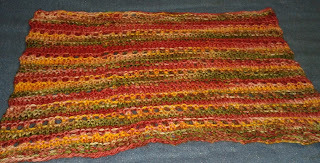 Mine done with Kertzer Sable, left over from my Glenora Jacket knit last fall. Quincy takes only a few hours to knit and produces a very warm hat. 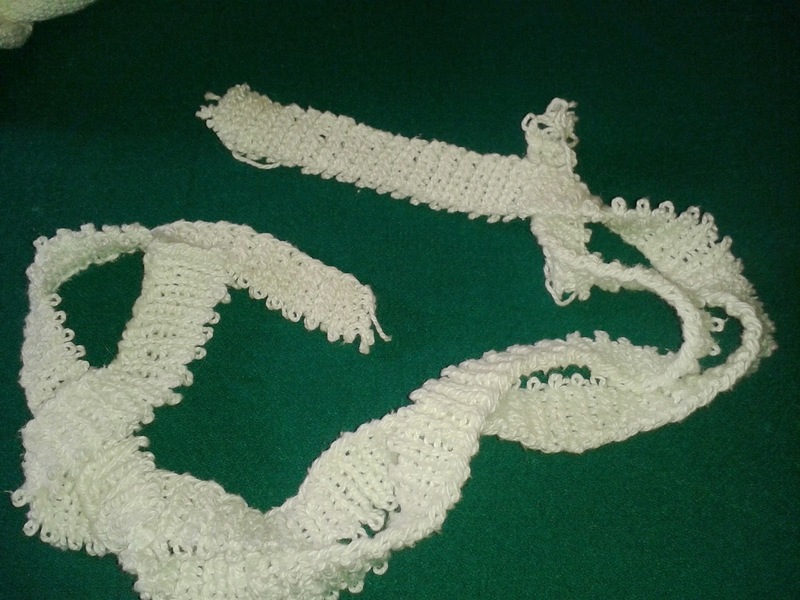 The bottom band is knit first, twisted and then joined in a circle. That twist produces a double thickness over half the hat. Cozy. Two for the head. Maybe necks are next. Spending the winter in Florida taught me many things. Not the least of which was 'Climate Matters'. I guess if I had thought about it I would have known that with cold weather, one needs more hand knitted items - mittens, hats, scarves etc. Conversely, if the weather is warm, one needs them less. But beyond that, Florida taught me that is the weather is cold, and one doesn't stay outdoors for hours on end, then one has more time and more importantly, more inclination to knit. When the weather is warm not so much. And so my two months in Florida produced little knitting. Here is the sum total of all I did - and that includes the 20 hours in the car going down and again coming home. All of these projects, but one, are stash busters. That being a goal of mine for 2016. 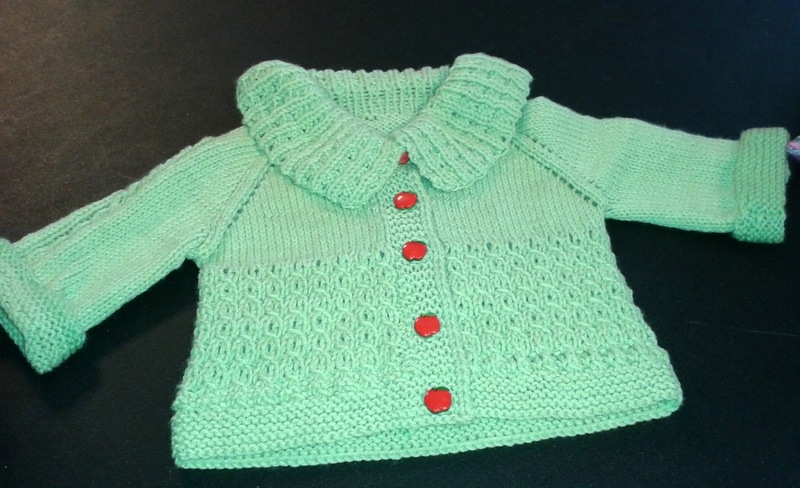 A baby sweater. 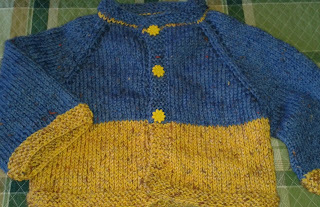 Top down from Cabin Fever's baby book and using Cabin Fever, Cotton Tweed. A washable cotton /acrylic combo, perfect for a new Mom. 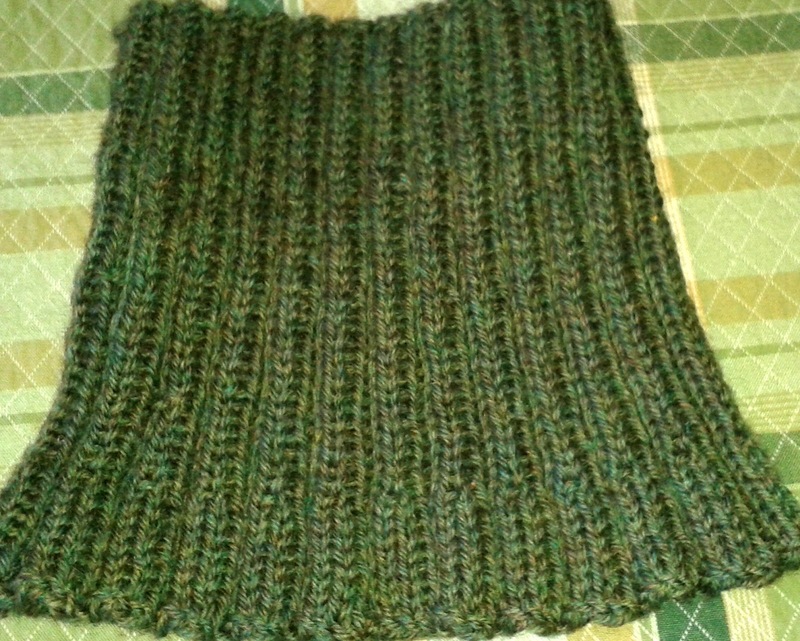 A masculine cowl. This pattern is a freebie from Chez Lizzie and used up some leftover Cacscade 220. Elizabeth calls it the Boring, Unglamorous, But Essential Neck Thingum. Exactly - essential Canadian winter wear. The shades of natural neck wrap is the Crescent Scarf from Cabin Fever. Although quite a bit heavier than the recommended weight for Crescent, my Cascade Eco Duo natural fibres in natural colours made a lovely soft squishy neck piece that stays put. This brightly coloured cowl, I might have completed before we set out for the south. So if you have seen it previously, my apologies. It is a simple cast on of 100 stitches, then an inch or so of stockinet sandwiched between an inch or so of moss and repeated until my yarn ran out. This yarn too is very soft and squishy, barely spun and brightly coloured. A ball snatched from another of Sandy's sister, Bag Lady Sue's great give-aways. Thanks, Sue. And lastly, a new purchase bought specifically for the trip. 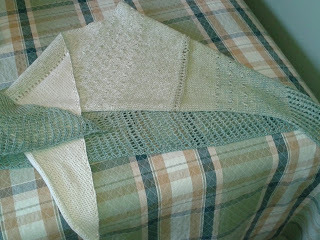 It is a Shirley Brian shawl kit that I bought at Wool&Silk in Shelbourne. Shirley's creative kits make beautiful shawls. 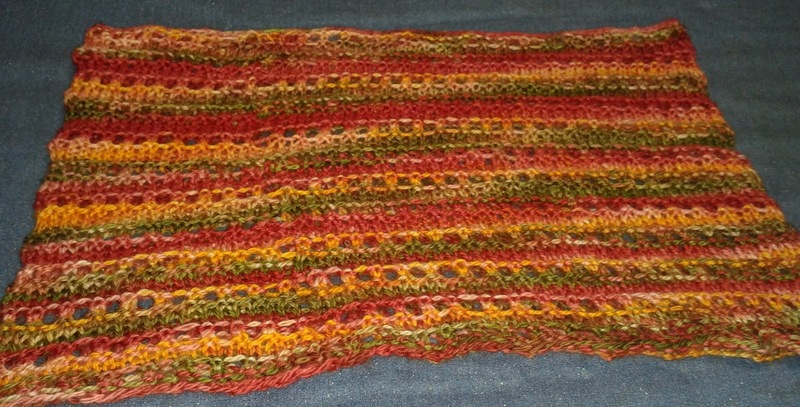 Using 4 strands of cotton about the same thickness as sewing thread, the shawl is plainly knit except for the periodic stitch patterns. The stitch patterns take place at the same time as the colour changes. No work for the knitter, though, as Shirley has tied off one strand of the previous colour together with one strand of the new colour. This shawl started with the 4 strands of ivory, then went to 3 ivory, one green, then two ivory two green and so on. Fun to knit and the cotton is perfect for summer. And that's it. My lesson learned is that climate controls my knitting output. Two months in Florida means it has been a long, blog-less stretch. My apologies to readers who like to tune in each week to find out what's going on with the Meaford knit group. But fair warning, we loved our first, winter-stay in Florida so much, we are seriously considering returning next winter. What's not to love? No ice to slip on. No snow to shovel. No blinding snowstorms to drive through. Hard to beat barefoot on the beach. 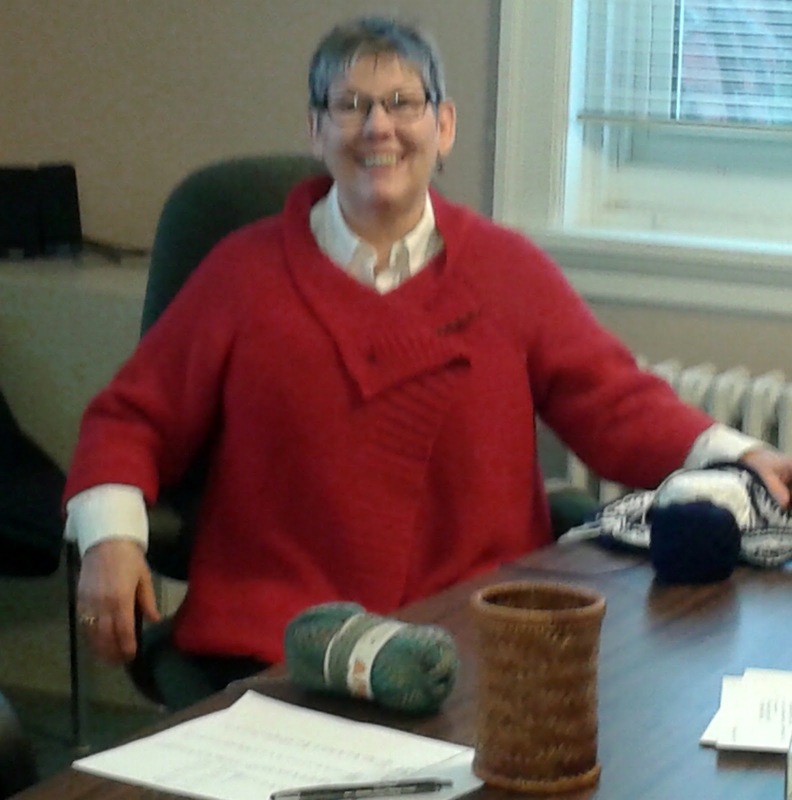 Today was my first week back at knit group and I was sure happy to be there. I got caught up on the news about town and caught up on the knitting. Sharon finished her Winter of 2016 Cardigan. 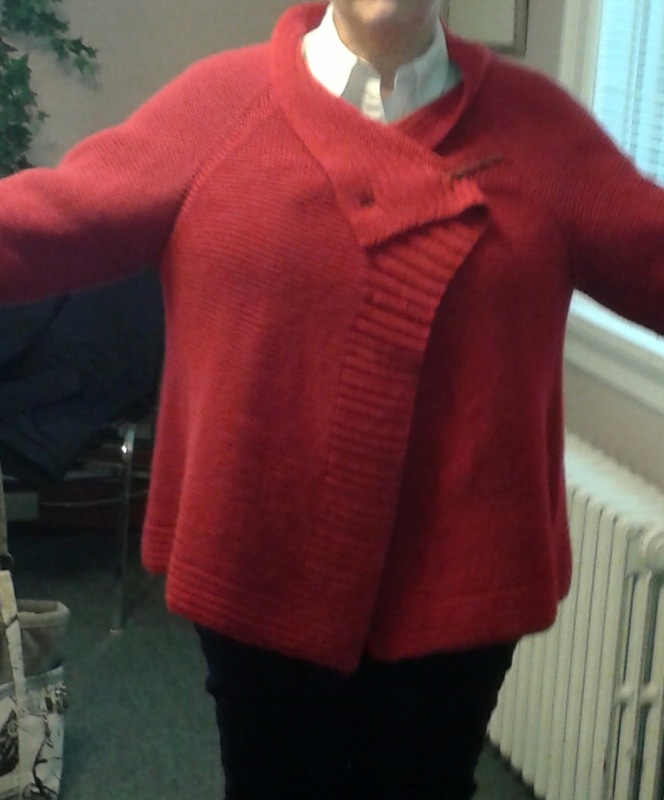 Red, garter stitch ( well, the sweater is called The Garter Stitch Cardigan but Sharon missed that point and did it in reverse stockinet) and a sassy swing make it perfect for Sharon's colouring and body type, I think. It look great. Bonnie showed me her bright socks. A pattern from my book Need a Sock? It's nice to know it is still being used. Thanks, Bonnie. Wilma has a baby blanket on her lap. Using up stash she said. And what's that around her neck? A Bandana. 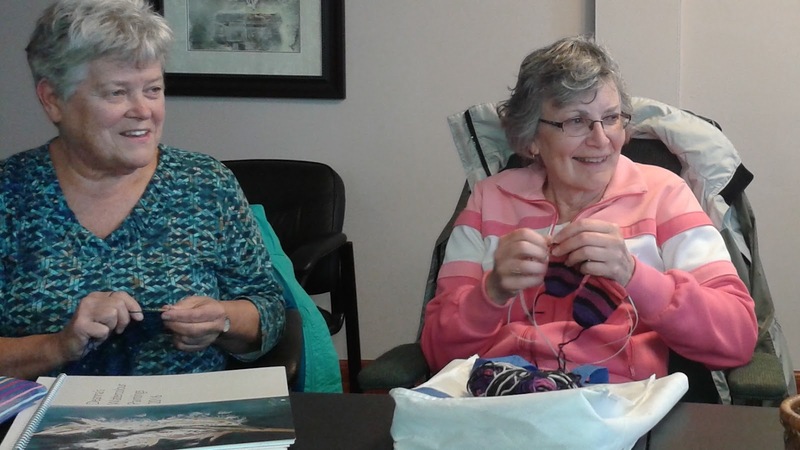 This one crocheted in cotton she purchased at the LYS in Stony Plains Alberta when she was out that way this winter visiting her daughter. 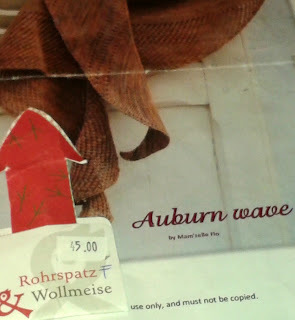 Wilma shared the pattern and I think a few of those might be on my stash-busting radar. Thanks, Wilma. Deanna has started a lovely shawl. The pattern is Autumn Wave and Deanna is using this yarn (German, we think??) 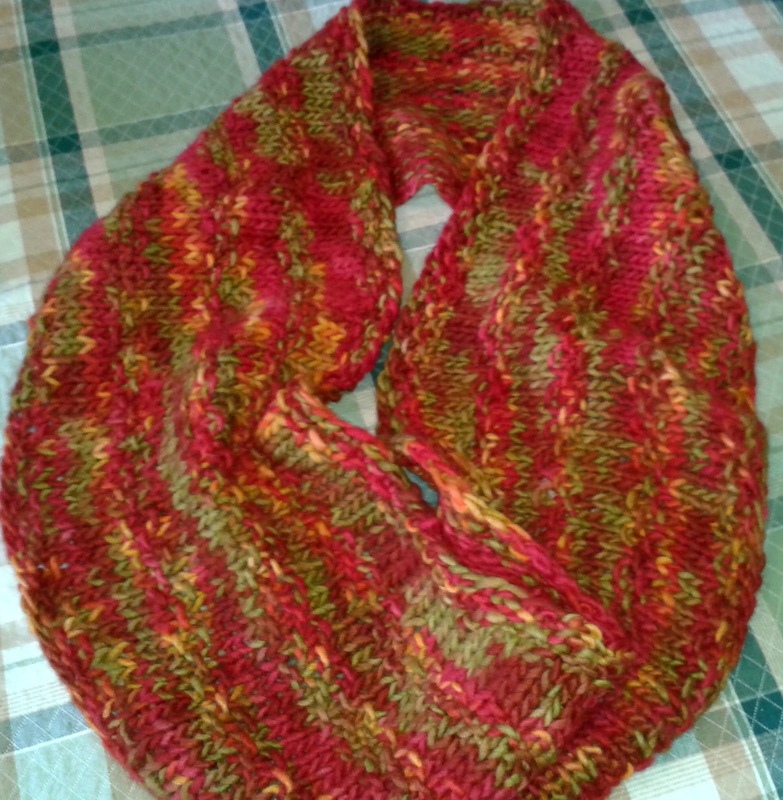 she purchased at the KW Knitters Fair. Paying far less than the amount shown on the price tag she added. It is nice to go away but it is wonderful to have great knitting friends to come home to. And to think we do this every week.